When I was younger, I hated eating tomatoes. I think it was the texture of them that made me want to spit them out whenever I ate them. As I grew older, I began to understand the health benefit of Tomatoes. Tomatoes are one of the best foods you can eat. They are high in an ingredient called lycopene. Lycopene is the main ingredient that causes the deep red color in the plant. Some studies say that tomatoes may help prevent osteoporosis, cancer and may even lower cholesterol. I cannot eat a tomato plane! So when I want to eat the plant, I need to mix them with other things. 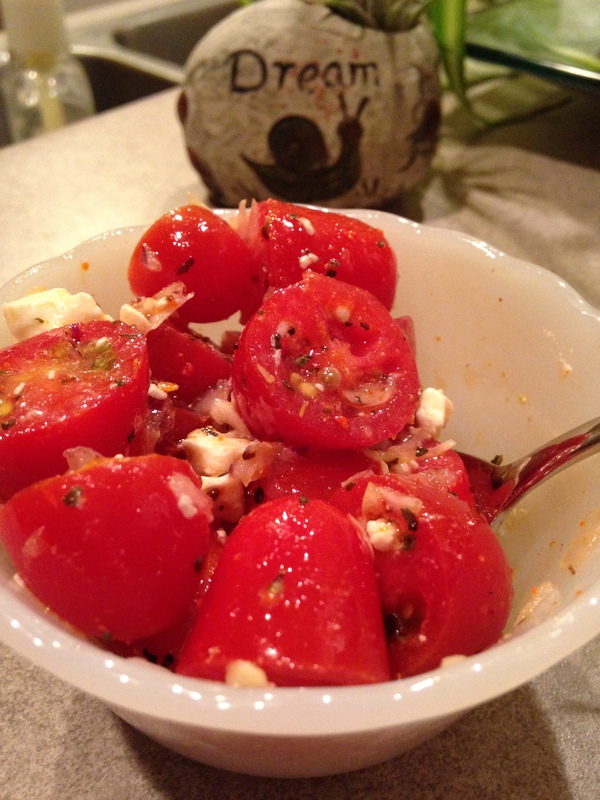 Here is a simple recipe for a Tomato Feta Salad. Literally this will take you 5 minutes to make and it is DELICIOUS! I have also included optional dishes to liven up the dish. Chop up tomatoes and add to a mixing bowl. Add chopped onions. Mix olive oil into the tomato mixture. Add all seasonings to mixture. Add feta cheese just before serving.